Organisations, of all kinds, are facing the challenge of rapidly advancing technologies, and ever-increasing levels of competition, both nationally and globally. They are also seeking to operate in an environment where the traditional relationships between employer and employee are rapidly changing. Learning to harness the talents of everyone comprising an organisation is critical to sustainable organisational effectiveness. Successfully developing the talents of all members of an organization is, arguably, the only lasting source of competitive advantage. Michael Pearn, Senior Consultant, Saville & Holdsworth Ltd, 1981-1984; Founding Partner of Pearn Kandola, Occupational Psychologists, 1984, retired 1999; Fellow of BPS, The Institute for Personnel and Development, The Royal Society for Arts; Member of Board of Examiners in Occupational Psychology, The British Psychological Society, Executive Board, Trinity Institute for Management Education, Association for Management Education and Development, European Association of Work and Organisational Psychology Books authored: Job Analysis for Managers (1987), Learning Organisations in Practice (1995), Tools for a Learning Organisation (1995), Ending the Blame Culture (1998), Empowering Team Learning (1998). Part I: Approaches, Concepts and Theory. Learning Theory and the Construction of Self: What Kinds of People Do We Create through the Theories of Learning that We Apply to Their Development (J. Burgoyne). Who Am I? Self-development in Organisations (M. Lee). Cognitive Science and Individual Development (J. Henry). Individual Differences Can Both Facilitate and Limit Individual Development (K. Murphy). Old and New Models of Cognitive Abilities: the Assessment Conundrum (B. Torff and E. Warburton). Personality, Style Preference and Individual Development (A. Furnham). To Use Competencies or Not to Use Competencies? That Is the Question (P. Sparrow). Emotional Intelligence and the Development of Managers and Leaders (V. Dulewicz and M. Higgs). Part III: Assessment Tools and Processes. Assessing Individual Development Needs (K. Van Dam). Individual Asessement as a Integrated Tool in a Systematic Management Process (J. Iten). Development Centres: a Neglected Perspective (J. Zaal). Part IV: Development Methods and Processes. Choosing a Development Method (A. Mumford). Team-working and the Implications for Individual Development (R. Mottram). Informal and Incidental Learning in the New Millennium: the Challenge of Being Rapid and/or Being Accurate! (V. Marsick, K. Watkins and J. Wilson). Individual Development and Self-management Learning (I. Cunningham). Using Social Networks in Organisations to Facilitate Learning (R. Poell and F. Van der Krogt). Online Networking and Individual Development (G. Salmon). Developing Individuals for Leadership Roles (C. McCauley). Developing Innovations in Organisations (N. King). 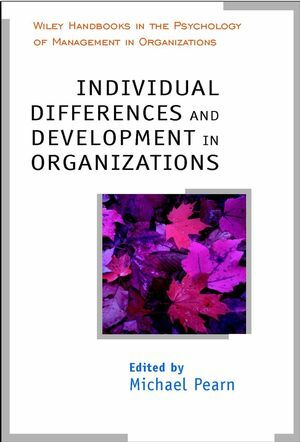 Diversity and Individual Development (R. Kandola and S. Kartara).